Inside Hae Woon Dae, there are perhaps 20 years of Atlanta “best of” awards all set out on rich wooden walls, thickly paneled. It doesn’t take long to gain the impression that they’re all earned. Just watch the staff. Watch how they talk to tables. Look at the size and thickness of the meat servings. Look at the “charcoal guy”, coming out to top off those folks cooking food at their tables. Yes, they charcoal broil meats here. There isn’t any of that portable butane torch gear being used here. 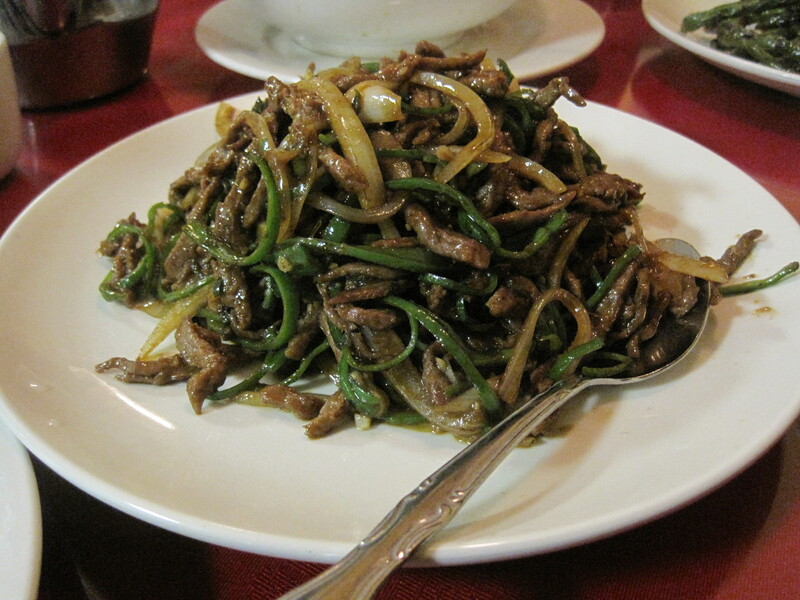 LA galbi, thicker than most and richly flavored. I’ve been in the past, long before I was a food blogger and recalled I liked it. I went back on a day I couldn’t think of a better Korean place close to work. The corner of Buford that Hae Woon Dae is on is not my favorite, especially at night, so I went at lunchtime. It was a pretty late lunch and still there were people peppering the eatery. 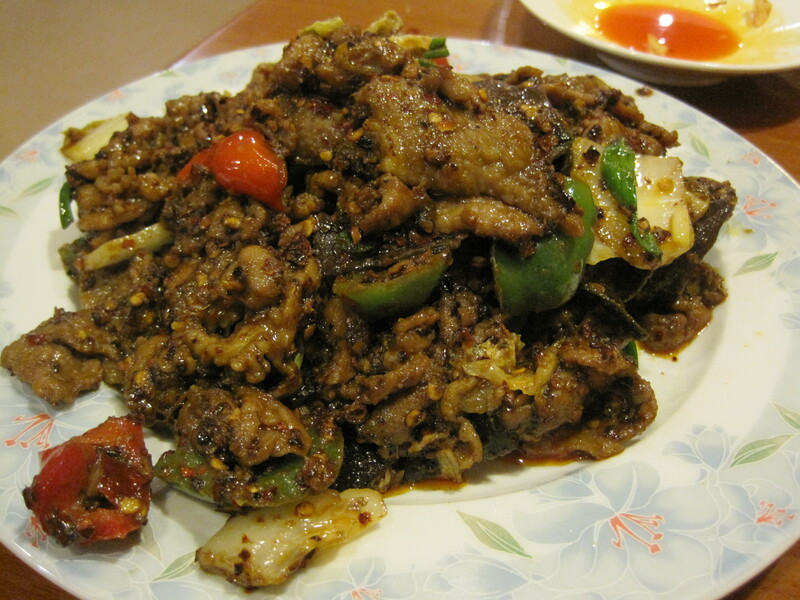 The LA galbi I had was as thick as my thumb, unusual in this city where 5 millimeter thick meat is more the norm. Thinner meat cooks faster, you see. But sometimes, to develop flavor can take longer. What I had at my table was worth the wait and the couple extra bucks. 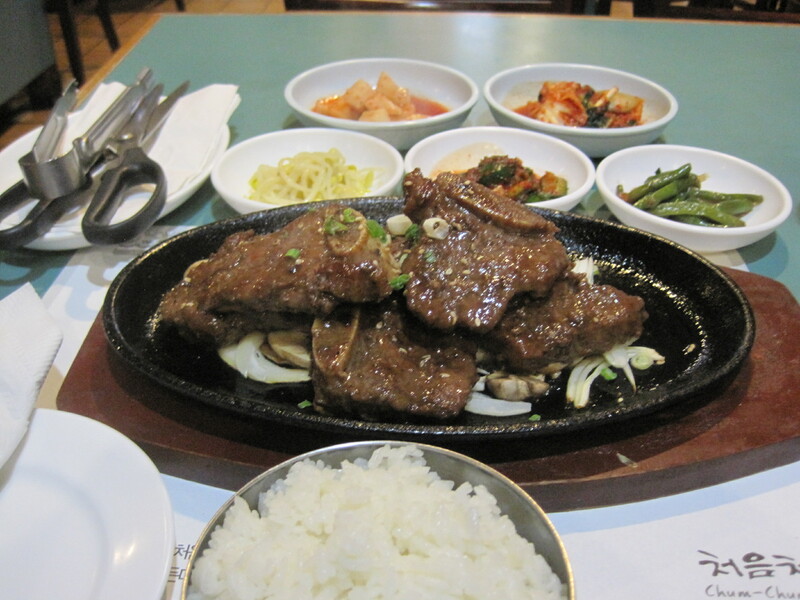 There was some chew in the meat, but I’ve not ever found galbi with the consistency of pot roast. Whatever I might say further about this restaurant would hardly change its decades old reputation. Just count me among the many food fans who raise two thumbs up to this venerable Atlanta institution. 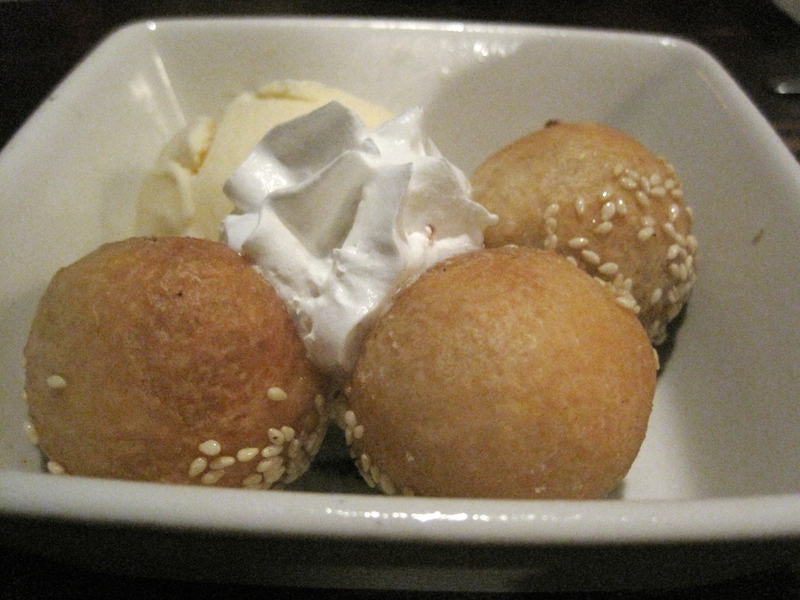 The sesame balls at Shoya Izakaya are something my wife favors. She’s not as high on the ice cream, but my daughter is happy to finish that. I seemed to have surprised my waiter when I ordered mookunji godenguh. He warned, “This is a very traditional dish.” I’m not sure entirely the purpose of the warning, but I told him that I didn’t care. What I didn’t tell him was that a mackerel and kimchi stew sounded just about perfect: small oily fish and plenty of vegetables was entirely all right by me. And in retrospect I should have taken a photo of everything, not just the dish. 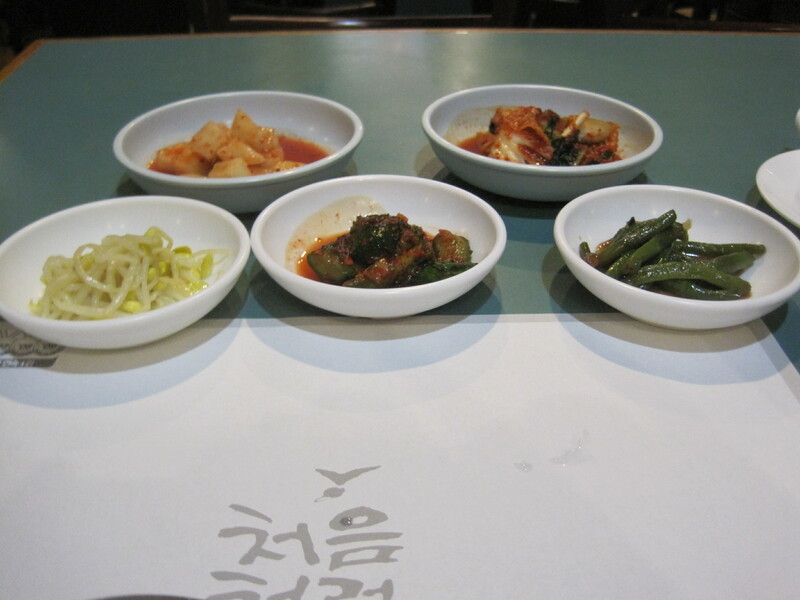 They pay a lot of attention to color at Woo Nam Jeong, and the array of food is always visually appealing. The taste? 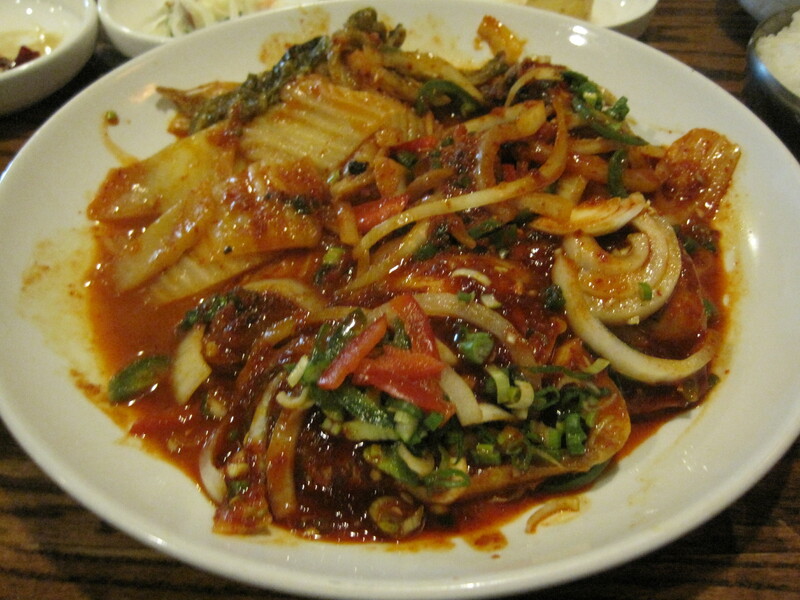 The spicing here seemed really on, the fish was moist and delicious, the kimchi really hit the spot. This was easily the best dish I had in many days. I stepped in because BuHi tweeted he would be there, and I wanted to be sure he was okay after his ligament issue. Two fingers are wrapped these days, but he can still handle a knife and a fork, and spin a yarn. 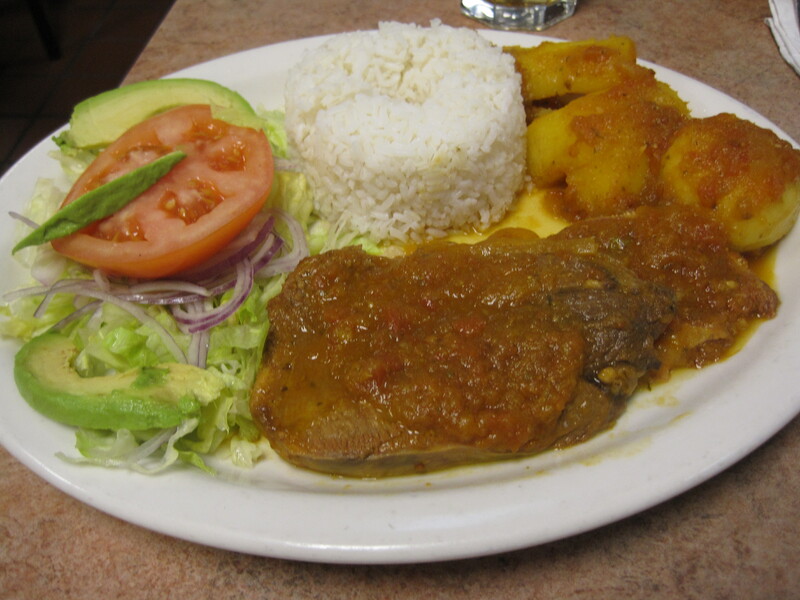 I had La Casona’s lengua a la criolla. It was tomatoey, savory, and unbelievably soft. Too bad rice and starchy vegetables are too much for me these days. It was an event organized by the 285 Foodies crew, and I caught wind of it through a personal invitation by Mike “Gadgetgeek” Stock. I was hesitant. He told me to sign up, and he’d make sure it all went well. In retrospect, I’m glad he did, because the event was pretty fantastic and I’m both overly stuffed and grateful for the opportunity this group gave me. Gu’s Bistro lies about one block north of Buford Highway Farmer’s Market, in a strip mall mostly full of wholesale stores these days. It’s a bit off the highway, so you need to drive into what appears to be a half-abandoned mall. It’s in the same location as the now-defunct Chong Qing Restaurant. When I drove up and saw it, I thought I recognized the location. I have a photo, too blurry to scope out the name of the place. It was a large crew, 27 at final count. It was a 15 course meal. No, I can’t remember all of it. Some of the photos came after people ate. Not everything is pristine. Some photos are of personal servings, some are the “left behinds”. That said, let’s start working our way through the food. 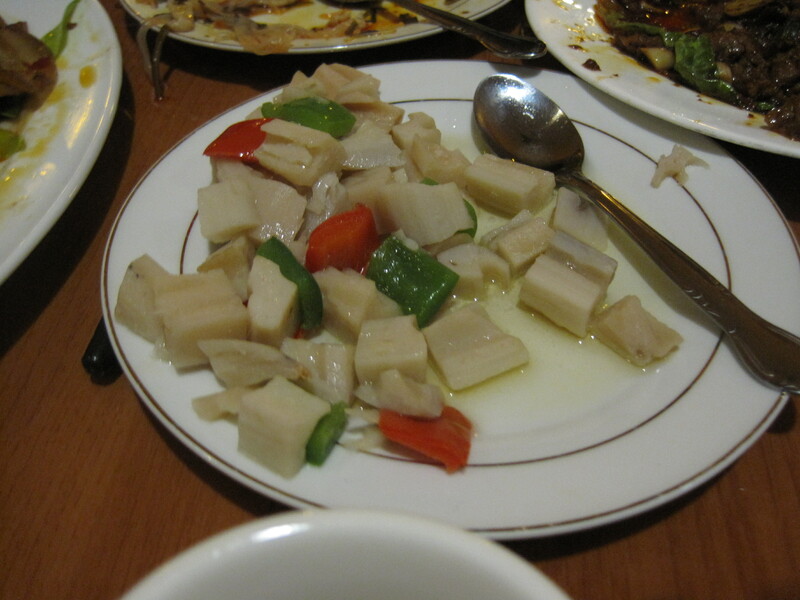 Lotus root was an appetizer and it was good. Spicing reminded me of a lighter version of the cumin lamb served later. It has some starches, and so would be considered a carb in an exchange diet. 3/4 cup would equal one exchange. Husband and wife (meat and lung) was good. 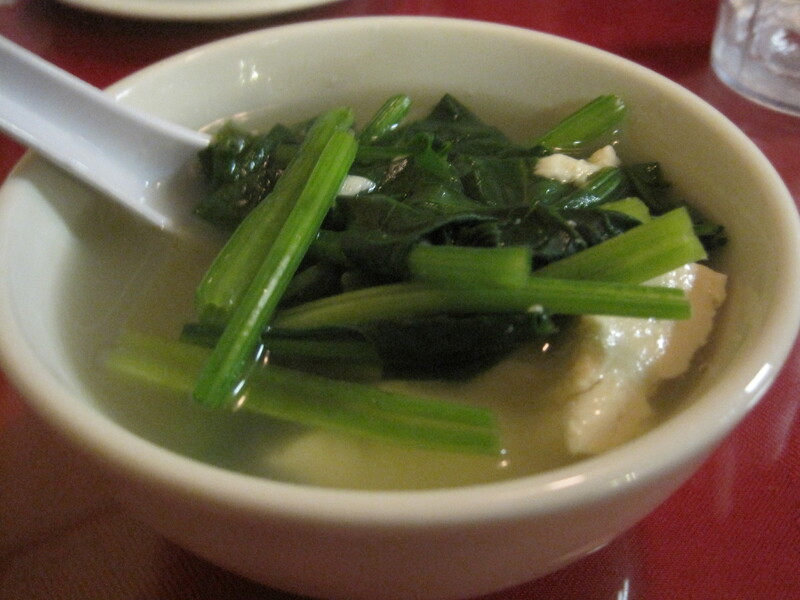 There were a series of dumplings and noodle dishes about this time. I didn’t eat those. Doesn’t work with my diet. Spicy chicken in hot pot was good, richly spiced, and reminded me of the excellent soups in the Chinatown food court. 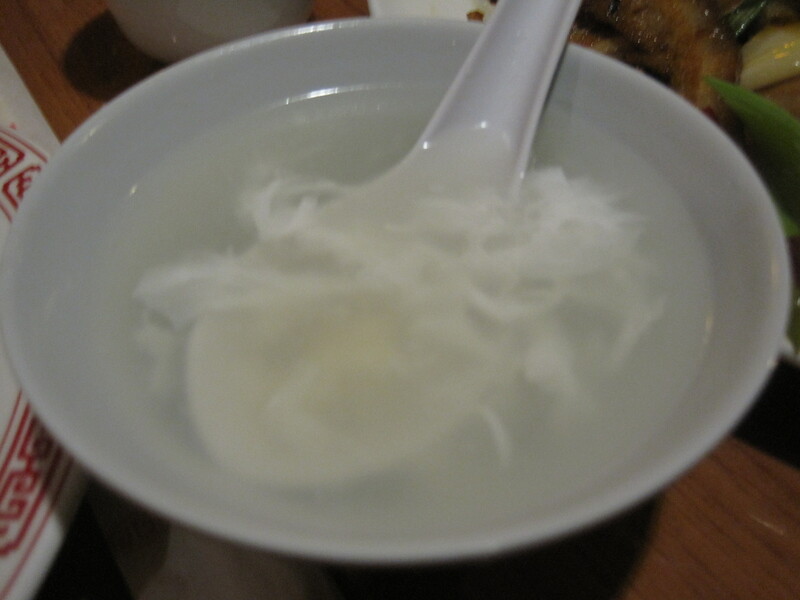 The fish maw soup was very well received, and the stuffed tofu surprised everyone. 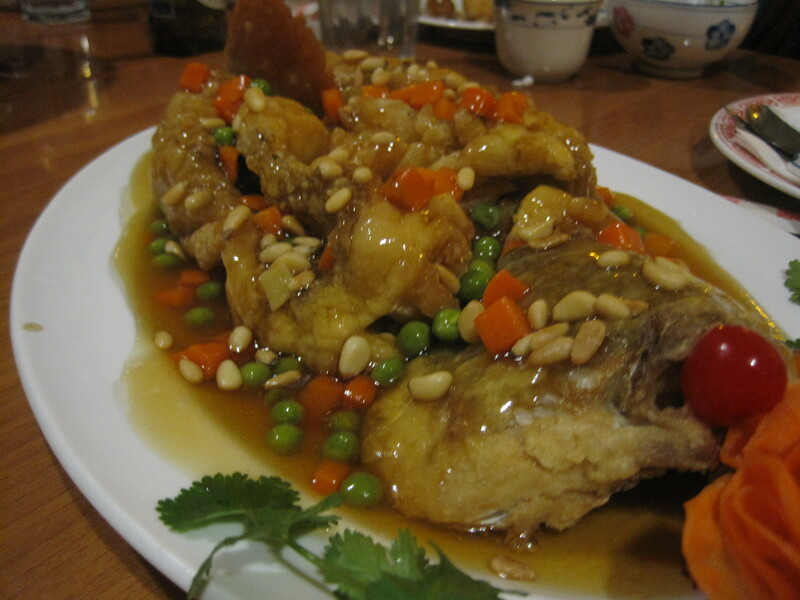 Squirrel fish was a pretty dish. 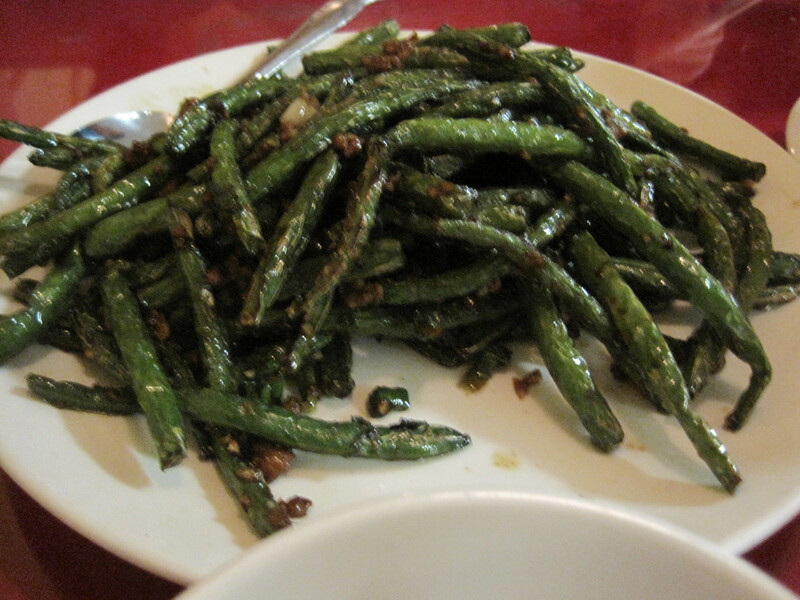 The version of dry fried string beans we had here was respectable. Cumin lamb and the tea leaf duck were excellent, the smoked duck, when you could get a dark burned looking piece, approaching the sublime. Not everyone at the meeting agreed with me and the cumin lamb. I ended up taking some of that home. After the meal, the chef came out and greeted us. I wish my photo of Julia (Foodgeek) and the chef had come out. Having a great photo of the two people most responsible for this meal would have been a terrific ender to this article. Let’s just end instead by suggesting that if you have the opportunity to share a meal with this crew, it will be memorable. Girls, model pretty and impossibly thin, are chatting with their boyfriends. Young gay men are conversing, voices so silvery I look up, expecting to see a girl. Young serious Asian males with razor thin eyeglasses are sipping tea, looking as if they should be in a revolutionary Parisian coffeehouse of a previous century. Asian families of fifteen or twenty are celebrating a birthday. 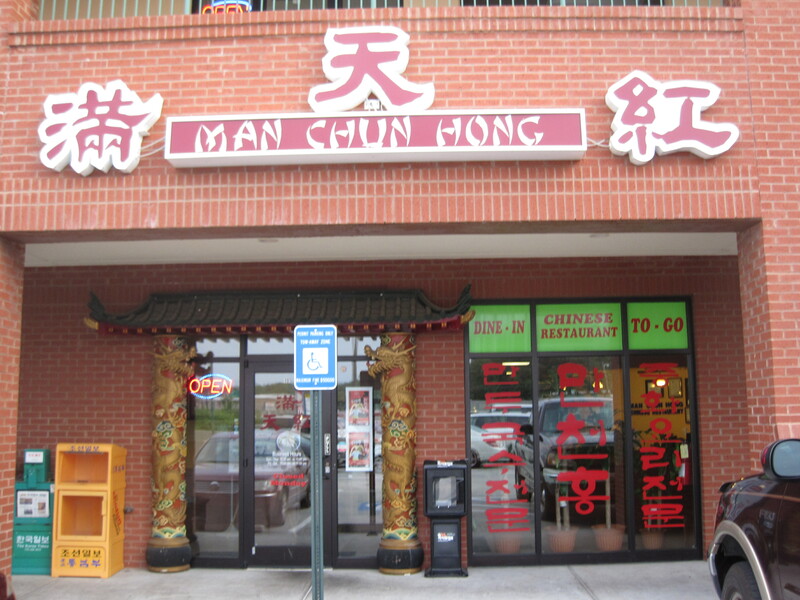 These are typical clientele of Man Chun Hong, a well respected and popular Chinese eatery in Doraville. 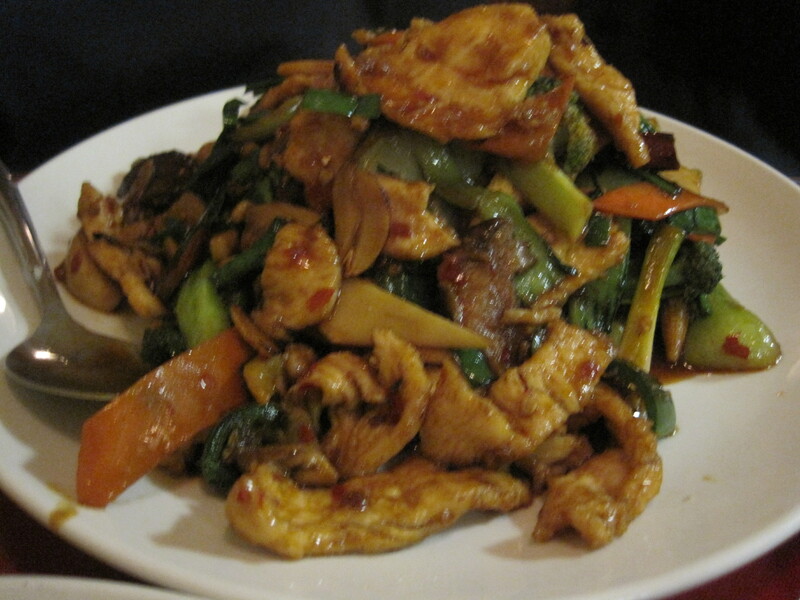 It is well known for good food, great noodles, and huge portions. It’s also a difficult eatery to puzzle out. 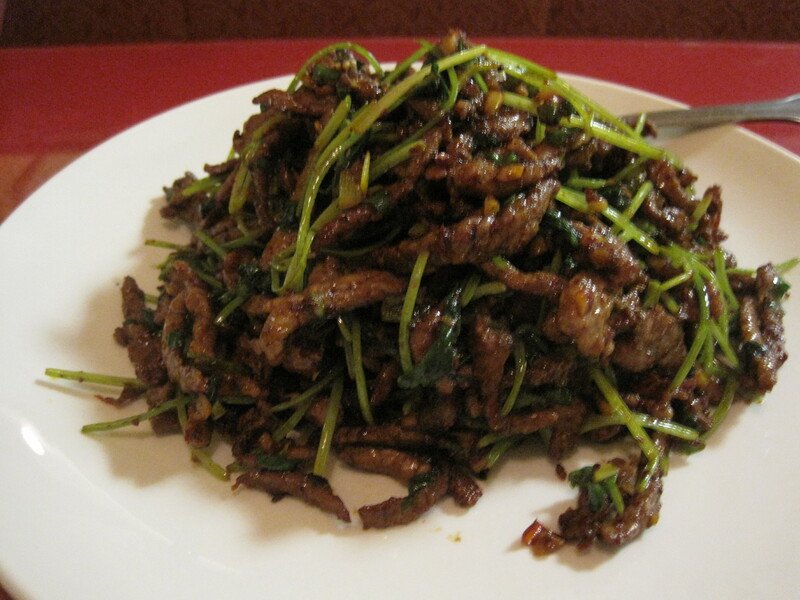 Those huge portions make it much harder to explore the large menu – or menus, as they have an American-Chinese/Korean-Chinese menu and then an authentic Chinese menu here. So recently I came here with my family, in part to show them Man Chun Hong and perhaps, to explore their foods a little deeper. It’s in the same strip mall as the celebrated Woo Nam Jeong, almost next door to it, and just south of the “L” shaped mall that houses Sushi House Hayakawa. The parking lot is small and narrow, a little tricky to navigate. Ordering has been a little different each time. My first time it was the American menu without question. Second time, I was handed the American menu and senior staff then countermanded what my waitress did, and gave me the Chinese menu (both menus are in Chinese and English). 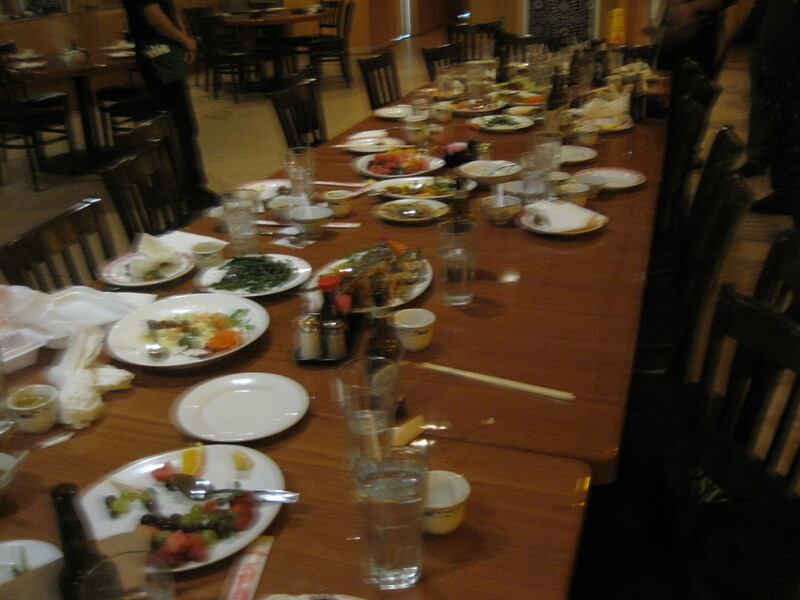 When my family arrived, we received the Chinese menu without question (Soon after, the wait staff were trying to speak to my wife in Chinese). 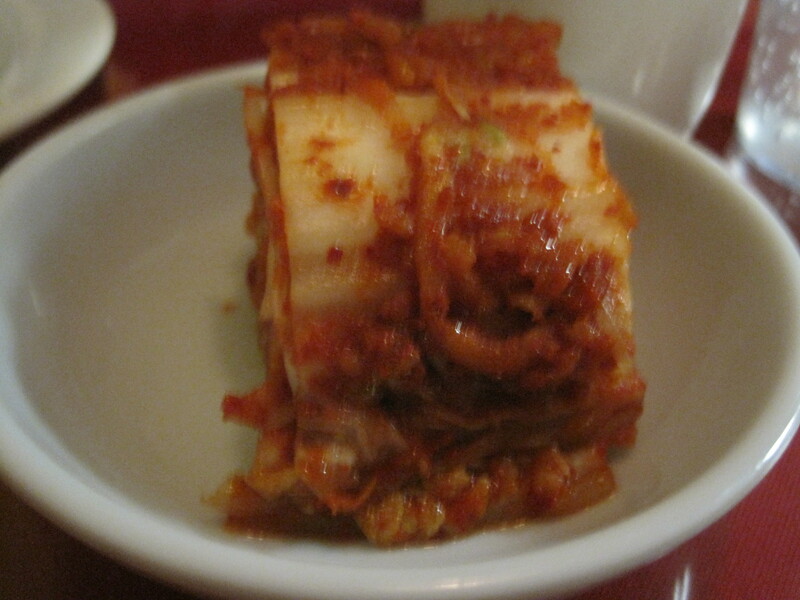 Man Chun Hong starts meals with kimchi, as an appetizer. A spinach and tofu soup soon followed. My wife loved the soup. 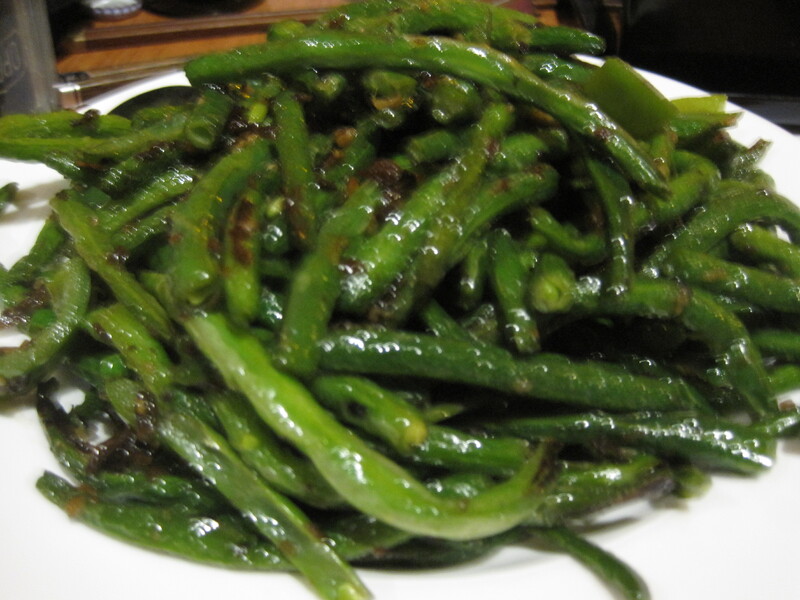 We also ordered dry fried green beans. Those were a hit. Entrees this time were a fish dish recommended by our waitress, a beef dish similar to the lamb, and my wife asked for something with “chicken and plenty of vegetables, but spicy”. There was some negotiating there. Having just finished the Fortune Cookie Chronicles I was silently wondering whether my wife would end up with broccoli in her dish. She did. 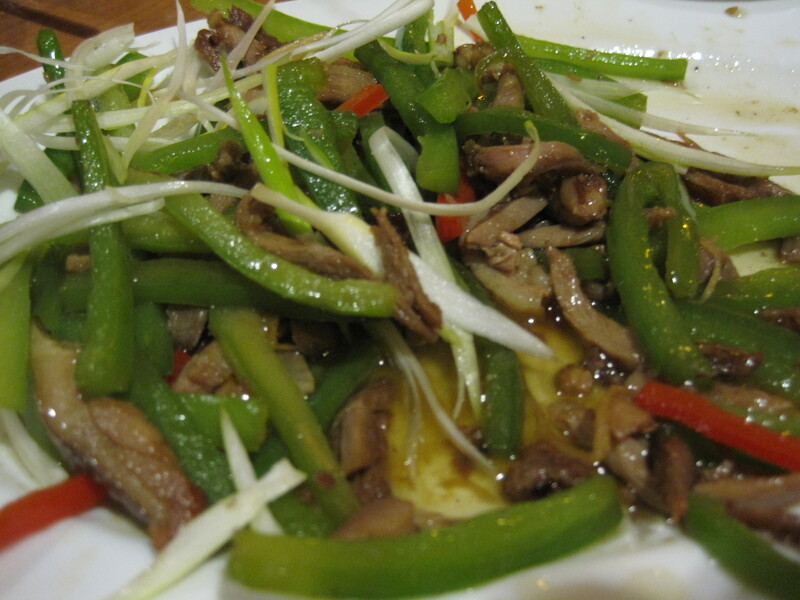 But the richness of the spicing, and the variety did please my wife. She ended up with something she liked a lot. My daughter chose a beef dish, after flirting with the lamb I had ordered. We all had mixed opinions of it. My wife vastly preferred her chicken. My daughter liked other dishes more. I thought there was nothing wrong with her beef, though I thought the coriander and cumin of the lamb dish I had previously had more ‘zing’. 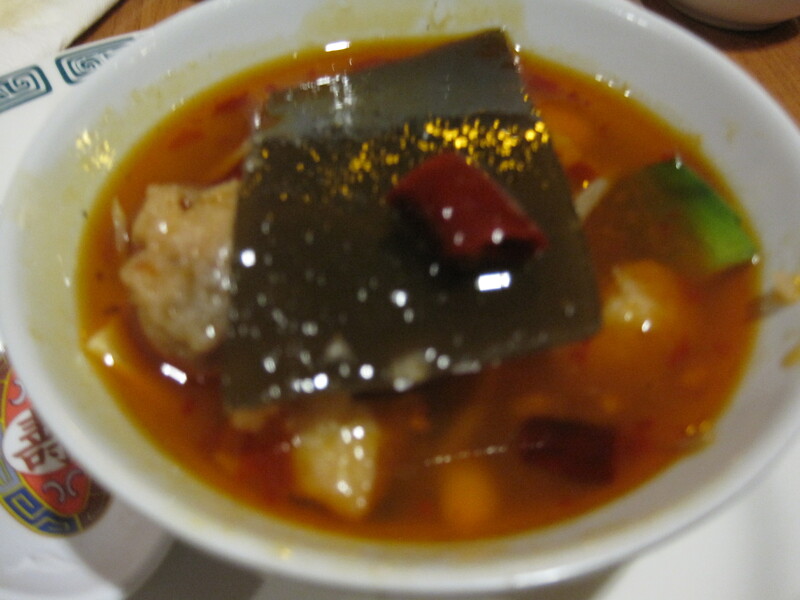 I had a spicy fish soup, mixed with plenty of vegetables. I had picked and unpicked foods several times. We were walking through the possibilities, and this is where we stopped. 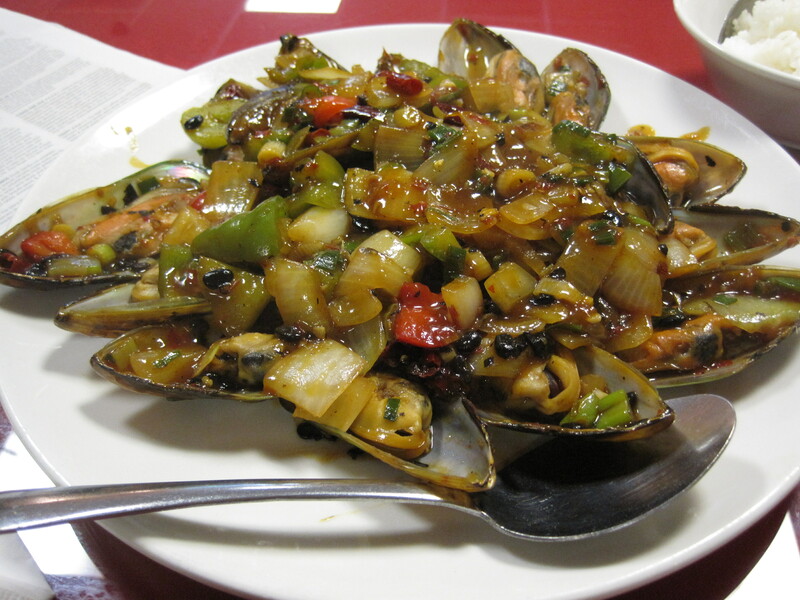 When tasting, phrases that come to mind: spicy, fishy, oily, good, too much too eat. It made great leftovers. We had plenty of leftovers. Verdict: A blogger favorite, Man Chun Hong is a versatile restaurant with a big reputation for excellent noodles. Highly recommended. 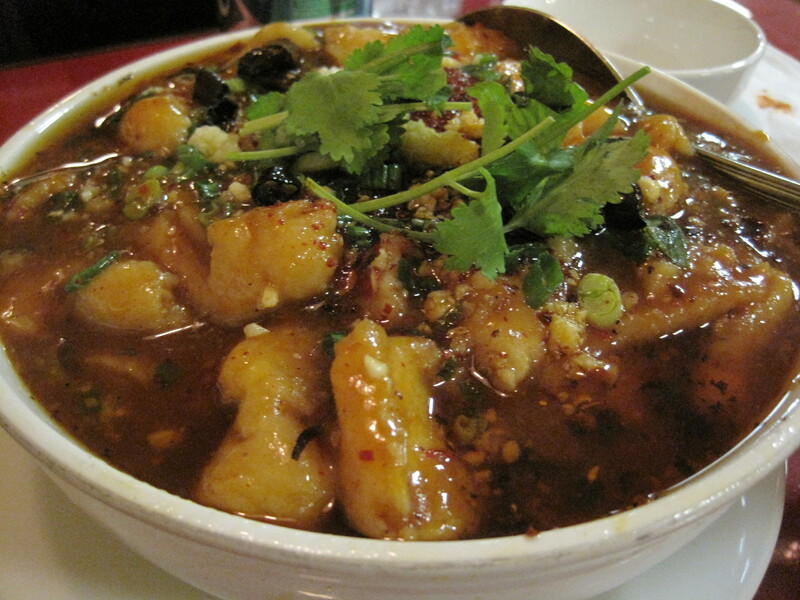 Notes: Other reviews of Man Chun Hong are here, here, and here. It’s new, it’s spicy, and heat makes me happy. 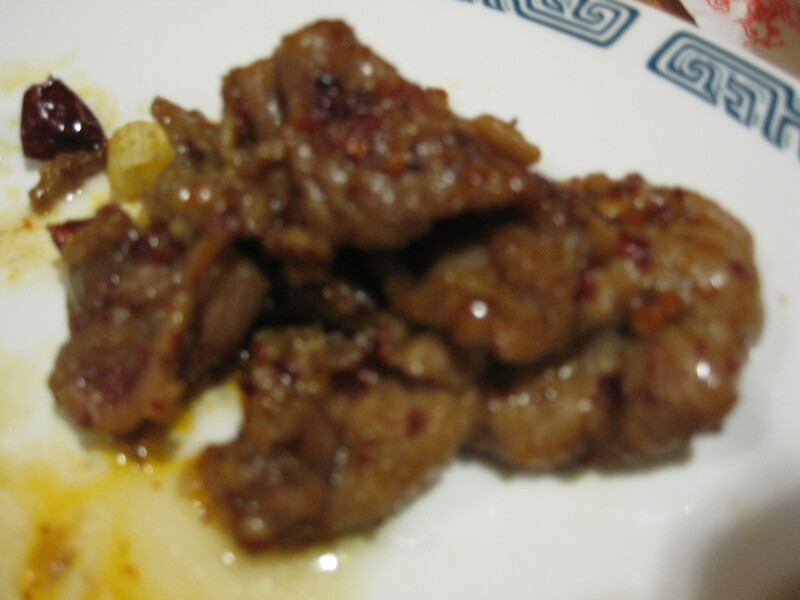 The pic below is the cumin lamb from Chong Qing, the one on Buford Highway, not the one in the food court. Spicy, but not as blazing hot as the waiter claimed. Located in a dead part of Buford, a forgotten mall perhaps a block north of Buford Highway Farmer’s Market, on the west side of the street, this is a new eatery in town. There are good reviews on this spot by BuHi and Blissful Glutton. Both reviews I recommend. I’m more the curious “point at this and hope” stage at the moment. I liked what I ate but no “WOW” from here as of yet. The other restaurant of the same name tends to give me “WOW” moments. I’m hoping. Fingers are crossed.